You've been on the hill for a few days now and this hang gliding stuff is starting to look like a something that could turn into a hobby. You're definitely going to have to give it some serious thought. One of the most important folks have to consider is the cost, and how it can be kept to a minimum. I&apos;ve been hang gliding for a long time, have taught quite a few people this wonderful sport, and have helped some of them save money in the right places. The purpose of this article is to help you make a wise decision when trying to be frugal. One of the last things you want to be cheap about is your glider. To be honest, if you can&apos;t afford a good glider, one way or another, you should probably postpone your decision to enter the sport. Whenever possible, purchase the glider your instructor recommends. He has been at this for awhile, and understands why a certain glider will be best suited for you. I, personally recommend a new glider in your class and weight range. There are a number of new gliders on the market these days that are incredibly well suited for the beginner pilot&apos;s first purchase. Those of us who have been around for awhile would have loved to have the opportunity to do our early flying in such nimble and forgiving aircraft. The modern-day pilot who is just starting out in the sport should consider himself fortunate. Although I would love to see all new pilots in new, state-of-the-art, entry-level gliders, the reality is that there are some really excited folks out there who would just love to get into this sport, but just can&apos;t afford a new wing. So if you&apos;re going to but a used glider, at least let me steer you in the right direction. If I were talking to you in person I would name the used gliders I think are well suited for you at this stage. Unfortunately that isn&apos;t the case, and since I don&apos;t know you or your aspirations in hang gliding I&apos;m going to give some guidelines to go by. DON&apos;T purchase a glider that was made before 1979. Period! The money you&apos;ll save won&apos;t justify the hassle and possible danger you may subject yourself to. Just because I ruled out all gliders made before 1979 doesn&apos;t mean I&apos;m recommending all gliders made after that. Quite the opposite. There are some gliders made since 1979 that I wouldn&apos;t wish on anyone. The hard part is judging which ones are good and which ones are bad. To begin with, if a glider was considered high performance in its day, that meant it was also hard to fly. If it was hard to fly then, it&apos;s hard to fly now. The gliders that fall into this category will be extremely cheap ($300-$500) and should be avoided. Most gliders that were good beginner gliders when they were built are still good beginner gliders now. The absolute best thing you can do when considering a used glider is to call up a reputable instructor and ask what he thinks about that particular model. If the instructor doesn&apos;t give you the answers you&apos;re looking for, call another. If two instructors agree that the glider model isn&apos;t for you, listen to their advice. As a basic rule of thumb you should plan on spending an absolute minimum of $700 for a reasonably good used beginning glider, but $1,000 to $1,500 is more realistic when it comes to a quality used wing. Again, buy new if possible. DON&apos;T buy a glider with lots of rust on the hardware. If the glider you&apos;re looking at has rusted bolts it&apos;s not been taken care of very well. You should do through inspection of the glider and its hardware. If you find rust on any of the bolts and/or other hardware you should also thoroughly inspect the aluminum tubes for corrosion (inside and out). Corrosion on aluminum has a different look than corrosion on steel. On Aluminum, corrosion will look like a white powder that is adhered to the corroded part. Usually this will be found on the inside of aluminum tubes and under sleeves. Look very closely at the end of all sleeves and around bushings and rivets. If you discover any significant amount of corrosion, move on to the next glider. DON&apos;T buy a glider with a dented or bent frame parts unless there is a professional willing and able to fix the glider with the appropriate parts. It is nearly impossible to find parts for many gliders on the used market. If a leading edge or crossbar is damaged it may be necessary to remove the opposite, undamaged part and duplicate it with raw materials. This is extremely labor intensive, and by the time your "new" glider is ready to fly you may have more money in it than you had planned on. The answer to this problem is to stick with a late model made by a manufacturer that is currently in business. 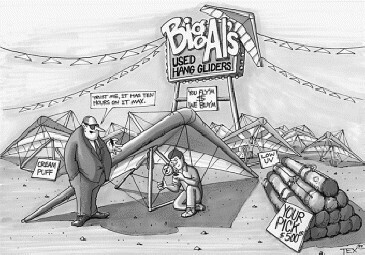 DON&apos;T buy or fly a glider that has kinked wires. Many used gliders will have wires that need replacing. Even gliders that are a year or two old may need new wires. If a side wire has a serious kink (45 degrees or more), it needs replacing. Tensioning and relaxing a kinked wire repeatedly will eventually lead to failure of at least some of the strands. Kinks next to or between nicos at the wire ends warrant special attention. Damage tot a wire where it enters a nico is much more difficult to detect than damage along the span of the wire. In addition, look for wire and nico fitting corrosion, which will probably require replacement of the wire. Many gliders will have heat shrink tubing over the nico fitting. After a few flying seasons, visual inspection of this area becomes more difficult as a result of discoloration of the heat shrink. If you cannot visually inspect this area you should carefully remove the heat shrink. DON&apos;T buy a glider for which you will not be able to obtain a batten pattern. One of the most critical consideration when it comes to glider stability and performance in maintenance of the airfoil. This point is more important than most people realize. DON&apos;T buy a glider before you fly it. You might think this would go without saying, but I often encounter people who bought a used glider without actually trying it out. Just because you&apos;ve seen the glider fly doesn&apos;t mean it&apos;s going to fly the way you expect it to. This doesn&apos;t apply as much to a new glider, because it will have been pre-tuned and test flown twice before the customer receives it. This ensures that the glider being purchased will fly as close as possible to the one the customer test flew. You&apos;ll also do yourself a favor by test flying the glider you&apos;re considering in the kind of conditions you are familiar with, even if that means going to the training hill. Flying in nasty air is no way to get a good feel for the handling characteristics of a glider. Well gang, there are some guidelines to go by when looking at used gliders. Again, I recommend a new glider if you can afford it. As with all things I give advice on, if you have a dealer or instructor you trust, go with his recommendation. This article is not meant to override your instructor&apos;s suggestions.